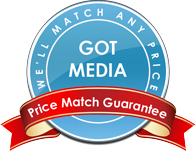 GotMedia.com sells CD DVD Thermal Ribbons for Primera, Teac and Rimage CD DVD Thermal printers at competitive prices in Orange County, CA. Be sure to also look through our inventory of thermal printable dvd-rand thermal printable cd-r media. If you would like assistance in choosing the right CD DVD Thermal Ribbon for your CD DVD thermal printer, don't hesitate to call one of our knowledgeable representatives at 1-866-409-1090. Black Thermal ribbon for monocolor printing on CD and DVD with Teac P-55 Thermal Printer. This is an original OEM TEAC ribbon. It is compatible with Teac P-55 thermal printers. 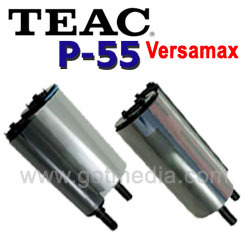 The Transfer Ribbon Set for Teac's P-55 Thermal Printer contains 2 ribbons. Each Ribbon prints 500 impressions. The Transfer Ribbon set compliments the Black Monocolor Ribbon set. The Versamax Ribbon allows users to print on many different CD and DVD surfaces. You no longer need to buy media that is specially treated for color thermal printing. The Versamax ribbon prints in color using a 4 panel CMY ribbon which contains Cyan, Magenta, Yellow and Adhesive/Primer panels.